As Ivy begins to point out where she fell from her rickety front door steps, an ear-splitting whistle blast completely obliterates her fragile voice. Throughout the repeated blasts, she carries on as though nothing happened. After all, it’s just her old friend the Mississippi Central Rail Line. It’s the 8 AM freight run, one of many daily. Even though the rail line is just a few feet past her backyard, she’s so used to the noise it doesn’t cause a moment’s interruption. 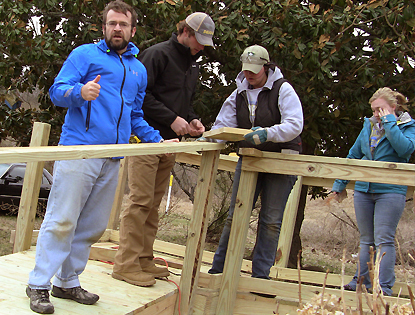 Thanks to you a team of volunteers from Brookings University in South Dakota is building 82-year-old Ivy a new wheelchair ramp she can use to roll in and out of her home. 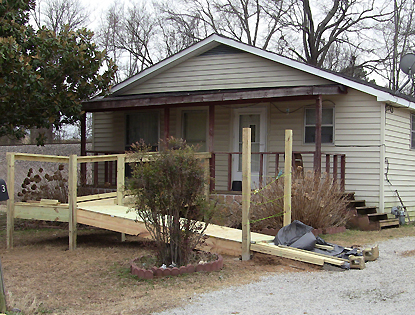 Having recently undergone hip replacement, she can no longer navigate her front steps. Ivy has no electrical connections outside, so once again the generator recently obtained as a result of your generosity powers the tools used to build the ramp. The new trailer you helped provide speeds delivery of materials as well, enabling the 22-member team from Brookings to work on multiple projects like Ivy’s throughout Holly Springs. Thanks to you, Ivy and many others can safely reach her driveway now. Your generosity makes a profound difference in the lives of thousands of people like Ivy, who have nowhere else to turn. Thank you.